One of the signs around East Cobb marking the former city limits of Chattahoochee Plantation. It was a city that once stretched dozens of miles up and down the Chattahoochee River. Standing next to the sign is Gary McKee, a resident of the area. Audio version of this story. These signs sparked our curiosity at WABE. We’d never heard of a city called “Chattahoochee Plantation.” But as we looked into the history of the area and the signs, we found a story stranger than we expected. Not only was there once a city in this part of East Cobb (an area that’s all unincorporated today), but it was one that was once 30 or so miles long. It spanned Cobb County’s entire border with the Chattahoochee River, all the way up to where the county meets Roswell and back down to where Six Flags is today. And for much of that length, the city was just 10 feet wide. Now, this got us really curious. What could possibly be the purpose of incorporating such a long stretch of land so narrow it couldn’t even fit a house? As it turns out, back when these boundaries were drawn in the late 1960s, the purpose was clear. It was to create something like an invisible force field to protect Cobb County from Atlanta. See at this time, in the ’50s and ’60s, the region was in the midst of a heated debate. “The larger issue at stake with the city at the time was what would be the size of Atlanta,” said Tim Crimmins, a professor of history at Georgia State University. Atlanta’s suburban white population was growing, Crimmins said. Former Mayor William Hartsfield thought Atlanta should grow and include these new suburbs. His successor ─ Ivan Allen Jr. ─ wanted the same. But these additional areas that the two Atlanta mayors hoped to annex? Areas bordering Atlanta, like Sandy Springs or perhaps parts of Cobb County? They weren’t exactly on board. “The reaction to the people who were living in the unincorporated areas to the expansion of Atlanta was ‘No we would prefer not,'” Crimmins said. There were concerns about a government that big, and, Crimmins said, there were also concerns about race. Atlanta’s African-American population was gaining political clout. This is what brings us back to those former city limits signs. 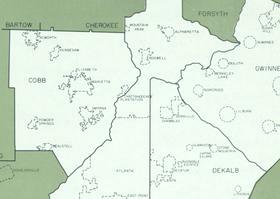 Starting in 1961, there was a brand new city called Chattahoochee Plantation. Developers hoped it would be a wealthy, white suburb. Crimmins said that’s probably why they put “plantation” in the name. To give it an Old South feel. By 1968, this new city didn’t have all that many residents yet. They hadn’t even voted in a city council or mayor. But that didn’t matter so much at least in the eyes of Cobb County legislators. They noticed the city was in a convenient place to send Atlanta and its mayor a clear message. “The Cobb County delegation introduced a change in city limits of Chattahoochee Plantation,” Crimmins said. In this change, they stretched the limits up and down the Chattahoochee River ─ so that the city covered Cobb County’s entire border with Atlanta and most of its border with Fulton County. This new incorporated area was just 10 feet across because that’s all that was necessary to make their point. “What you had then was in effect a symbolic strip, so that there was an incorporated city that would prevent any effort on the part of the city of Atlanta to expand its limits into Cobb County,” Crimmins said. It was effective; Atlanta never tried to annex any part of the county. In fact, Atlanta pretty much stopped expanding altogether. As for the city of Chattahoochee Plantation, well, according to resident Gary McKee, the people there, who lived in the original boundaries that were wide enough to fit homes and neighborhoods, actually didn’t care all that much about being a city. “Just was never that big of a deal,” McKee said. The residents never did end up voting in a city council or mayor, and in the mid-1990s, they even gave up their charter ─ that is, what made them legally a city for about 30 years. Today, all that’s left of it, really, are those former city limits signs.